There is always a strong reliance, as a human trait, upon what we learn from our parents. They give us a message which we, in turn, carry forward. For a long part of human history, verbal renditions were the vogue. In fact, a lot of what we see claimed for genealogical data came from tales, some of which were captured to paper or stone (to wit, Runes). Now, once some bit of fact is in a more permanent mode, is it any truer? That is, stories rely upon memory (suspect for several reasons), ability to repeat (again, information theory has something to say about this), hearing and interpreting issues, and much more. When something is captured to written form, it can endure centuries whether it is right or wrong (to wit, genealogical bits that were shown to be not true, yet persist -- even on the web, we cannot retract easily). 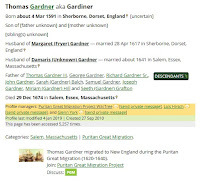 Not to pick on one family, as this problem exists everywhere, but Anthony Potter (see Notes), the 3rd great-grandfather (maternal) of Nathaniel Hawthorne, is a good example. Some have his first wife, Elizabeth Whipple, as the mother of his kids. Whereas she may have died without issue. So, that would make the second wife, Elizabeth Stone, the mother. When browsing, one can figure these things out by comparing dates, assuming that they are correct. Of course, a mother may have died at childbirth. The whole point is that there is no absolute certainty (as in proof) about these types of facts. Yet, we can rate things by strength. Too, we can show both the information that supports and that which casts doubt. In fact, that would make the field not unlike any science. That is, at any point, we can add to a strong state of knowledge or we can weaken a position. But, the fact would not stand alone and would need to have its data package (we'll look at this further). However, all tales of these types contain some element of truth. Isn't life better with them? And, hoping that some unsupported claim might be true, while waiting for confirmation or not, is better than a practiced, cynical, critical eye that assumes nothing (impossible for the human) until all facts are on the table. Of course, it boils down to the symbols (artifacts) in hand and their ability to support proof (another whole issue). Will this work always result in some dried collection of bones upon which we need to paint a proper hypothetical portrait (a human trait that is not bad, necessarily)? 05/05/2011 -- Did Thomas of Salem have a sister, Rachel? 01/09/2011 -- One would hope that each generation would leave behind some contribution so as to make the family history more solid, that is, reduce misinformation. Modern methods, and computation, seems to suggest such. Of course, disinformation (ought we say, dis-ingenuity) is always a possibility. 01/01/2011 -- We will have a post that points to sites that allow an estimation of strength through notes and such. 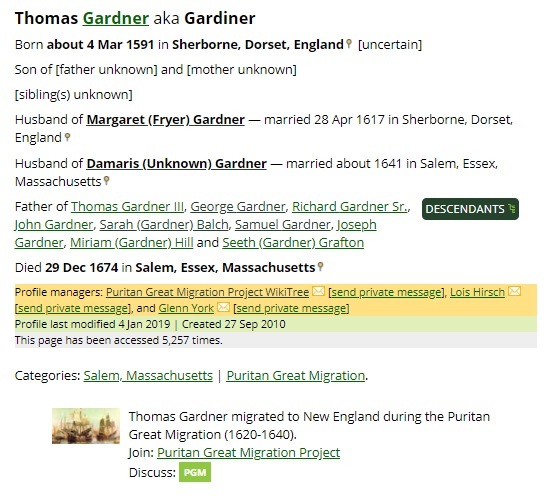 Earlier, we listed Thomas's (and Margaret's) children and grandchildren: Two generations. Then, we used one child to show a line from Samuel to Simon Stacy (DAR patriot): The progeny. Too, we mentioned that we will extend this Samuel line to Dr. Frank A. as we proceed. But, before we come forward in time, a few posts on the early times are in order. As one collects, for their tree those families who were early immigrants, the family count can go up quite quickly. Some of the interplays between families can be used to illustrate the points (RD, etc.) that have been discussed so far. So, let's pick the Hathorne example. 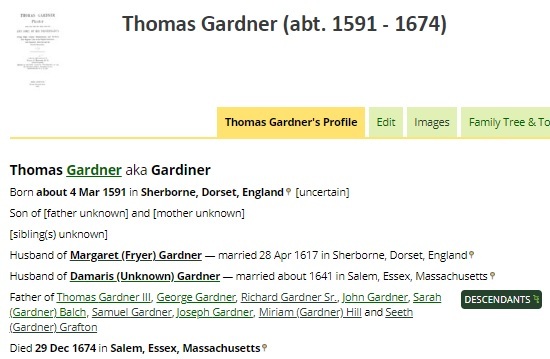 Here we can look at the descendants of two of the Gardner children, namely George and Samuel. Now, John Hathorne, the judge of the 1692 tribulations, married Ruth Gardner who was the daughter of George. It is from this that we get Nathaniel as a descendant of Thomas. Ruth's brother, Samuel (son of George), was the forebear of the John Lowell Gardners. Remember that the grandfather, William Hathorne, and father of John had come over with Winthrop (1630, Arbella). Concerning the Hathorne tie, the Neuman-Smith-Goodale family has an interesting tree that shows a pedigree for both John and Ruth. The Ruth expansion, in this tree, shows Stephen which we saw earlier. This post's research affords the opportunity to update the earlier descendants list in which Ruth was blank. We have two that we can show: Putnam, et al and Kathleen's Kousins. Aside: the current mode is collection (there is a whole lot of material available) and rudimentary analysis which will strengthen as we proceed. Now, another Hathorne tie is with Abel who is a grandson of Thomas, through Samuel. Abel married Sarah Porter. Her mother was John Hathorne's sister, Elizabeth. We can use the Neuman, et al, tree, from above. An interesting note is that Elizabeth and her husband, Israel Porter, led the unsuccessful effort to save Rebecca Nurse. Now, that brings in Simon Stacy Gardner, again, who is Abel's grandson. We had pursued the RD example, using his mother, Phyllis Stacy (Neuman, et al). A Remark (12/06/2010) suggested, also, that there was RD via a White line. We can add another using the Elizabeth through, for example (as there are several), the Capell line (Bevan's work). 03/01/2019 -- We're building an index by images on our Portal to truth. 09/04/2013 -- Again, the scene is built as follows. Those who came over are from the 10th to 13th generations back (for the most part) for someone alive now. By the time of 1692, lots of the earlier arrivals had passed on. So, that left the second generation (again, for the most part) as the elders. Now, taking a cohort mix (generational cut) round or about 1692 would give us someone on the current person's tree who would have about three generations living (including the level of their own cohorts). So, we would see siblings/cousins, parents/aunts/uncles, and the greats. In other words, it's a composite person that is built from that cohort mix (meaning, of course, that being on the tree implies ancestry) for which we can identify relationships blood (including 1/2 blood), in-law, and even friends. What Marjorie's chart does is to take someone who is in the mix and look at extended relationships. Now, consider what we would have if we did that for a large part of the composite mix. Would it not be an interesting view? 01/10/2013 -- The Bevan database was updated on 01/05/2013 which pushed pointers around (one of the risks of the rootsweb method). Will take awhile to follow all of these - the correction requires a simple adjustment of the pointer by 10s or a little more. 12/02/2011 -- More on Ruth (Gardner) Hawthorne. 02/22/2011 -- We'll be using the Great Migration material a lot. 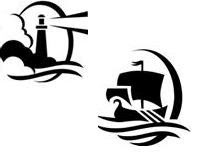 01/10/2011 -- The Winthrop Society has a passenger listing by some of the ships. 12/24/2010 -- Thomas has 6 pages, starting at page 731 (see NEHGS), in Great Migration Begins: Immigrants to N.E. 1620-1633, Vols. I-III. 12/23/2010 -- Would be derelict if I didn't mention, and use, this site by Roderic A. Davis, 2nd. As mentioned in the earlier post, the descendants list would be very large. That earlier post used Frank A's first book (1907). A later book (1933) covered George Gardner's line. The latter book, in part, looked at the John Lowell Gardners. Following the same approach as before, there are several families who have gathered this information. One example is the Larson tree which shows the Weld, Lowell, Pickering, and Peabody relationships. Another is the Dowling tree which we have seen several times before. Now, in terms of RD, there are several in this tree, starting with Mary (Gye) Maverick and Percival Lowell both of whom are on the gateway list. It would be interesting to pick through the tree to find all of the possible RDs. We might try that sort of thing when we do a post on Frank A. (see Remarks, 12/06/2010) that will provide one thread for Thomas/Samuel. Frank A. has several interesting RD nodes in his Gardner tree. The search will continue for more information. At some point, comments will point out missing pieces or, hopefully, will actually offer additions. One goal may be a data base that has been scrutinized, rated, and made available for reference. As we saw earlier, George, Thomas' second son, had eight kids. It is interesting to see this expansion of daughter Hannah's descendants (Larson family). We will be collecting more of these. 12/15/2010 -- Ran across the Larson tree, at this site which will be used again. Larson has descendants for these kids of Thomas (in order of the list): Sarah, Thomas (error?, note marriage to Lucy Smith), George, John, Samuel, Richard, and Seeth. 12/16/2010 -- Note that Charles Sanders Peirce (Wikipedia) is on the Seeth list. Edmund Wilson (Wikipedia) is on the George list. Both added to the descendants list. 12/16/2010 -- Conover's site is pointed to from the at wargs site and has an expansion for Seeth/Conant (Joshua). Here is another for Joshua for comparison. We'll be see trees from these two families as there is overlap with the Dr Frank A tree. 02/01/2013 -- Update for rootsweb reference for Larson tree. 02/08/2011 -- Saw a notice at NEHGS that William Addams Reitwiesner died in November of 2010. His site, at wargs.com, is being maintained by his literary executor. 10/11/2018 -- One goal is to have the first five generations documented in one place. We are looking at WikiTree for that.